This is one of the best looking, sounding and built major name snares we've come across in recent years. Sharp attack. Warm, fat tone. Versatile. High build quality. Some snare buzz issues when playing the small tom on our test kit. Philadelphia-born drummer and musical director Brian Frasier-Moore has played with Aaliyah, Usher, Janet Jackson, Christina Aguilera and Madonna. His Tama Signature Palette snare is a 14-inch x 5½-inch stunner in Bubinga ply. The 8mm shell has eight plies of African Bubinga with an outer decorative ply of Quilted Bubinga. By our measurements, the shell is exactly round. Offsetting the rich veneer is a thin 3cm chrome band inlay with badge and Brian's inscribed signature. Bearing edges are a sharp, double (inner and outer) 45° peaking on the outer two plies. The throw-off has a Tama radius-lever action with tension adjustment at both ends. Brian has chosen 42-strand carbon steel Snappy snares and Tama has cut a smoothly graduated snare bed to accommodate the extra width. With the massive die cast zinc hoops and 20 bulbous single-ended lugs the drum is weighty and looks and feels opulent. The 42-strand snares give the drum an extra dollop of snare-iness. It's an attractive sound - both ghost strokes and backbeats have a luxuriant, sibilant quality. Press rolls right up to the edge are crisp and fat. A wide 42-strand snare must surely dampen the resonant head more than a standard snare though, so it's important not to over-tighten the snares. The smoothly-cut wide snare beds help alleviate sympathetic buzz, which seemed only marginally worse than with a 20-strander. As for choking, the drum only felt uptight with the snares super-tight. Then the drum sounded crisp and poppy, almost like a piccolo. A great sound, but unfortunately striking the small tom provoked a horrendous snare buzz. 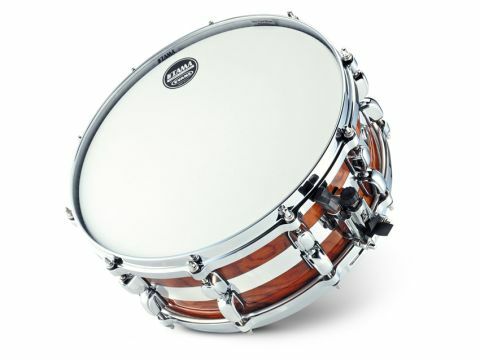 That aside we found the drum wonderfully versatile, a combination of warm woody dark tone with a sharp bite and awesome ringing rim shots from the die-cast SuperHoops. Double 45° bearing edges are said to maximise the energy transfer between head and shell while the sharpness of the accurate bearing edges increases attack. The chrome inlay looks cool, and Brian says it counteracts the warm woodiness of the Bubinga, giving extra "crack and attack". Brian's drum looks and sounds sensational. It's versatile, sensitive and powerful. Price-wise it's at the top end of signature snares, but you get what you pay for. The admirably round shell and all the fittings are top draw. The wide snares increase the sharp attack, offset by the fat, warm Bubinga tone.